Keranos, God of Storms ($6.99) Price History from major stores - Journey Into Nyx - MTGPrice.com Values for Ebay, Amazon and hobby stores! 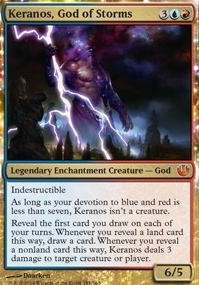 Card Text: Indestructible As long as your devotion to blue and red is less than seven, Keranos isn't a creature. Reveal the first card you draw on each of your turns. Whenever you reveal a land card this way, draw a card. Whenever you reveal a nonland card this way, Keranos deals 3 damage to target creature or player.